If this city hadn’t changed its name back to what it was two centuries ago, I don’t think it would have made my bucket list. Born and raised in Canada during the Cold War, I remember the Soviet Union as a threatening world superpower, and Leningrad as a scary socialist country under Communism. hats and fur hand muffs, hand-painted wooden nesting dolls, and lacquered boxes of horse-drawn winter sleighs on frozen white tundra. This is the Russian Empire of Peter the Great and Catherine the Great, the 18th century home of the imperial opera houses and concert halls, and the 19th century ballet capital of the world. St. Petersburg, renamed Leningrad in 1924, was and still is the imperial and cultural capital of Russia. Built in 1703 by Czar Peter I, it is a relatively modern city, compared to other historic European cities. But it has an art collection to rival the Louvre and a palace as grand as the one in Versailles. 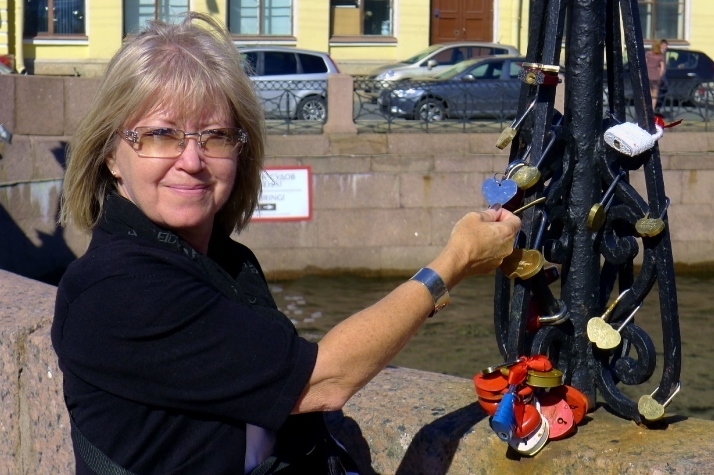 It’s now a star port on the popular Baltic Sea cruises and, last summer, became the highlight of our 11-day cruise through Northern Europe and Scandinavia. It’s a cool 61F (16C) outside when our moving hotel reaches its pier in early August. It’s before daybreak, but it’s not dark. Twilight lasts all night during the summer when you’re only 90 miles (145 km) from the Arctic Circle. St. Petersburg opened its doors to the West years ago, but there are still cities and regions in the Russian Federation that are closed to foreigners. Normally, when tourists arrive by cruise ships to ports of call, customs officials board to pre-clear passengers, but we have to line-up to show our passport and migration cards to enter and exit the country both days. As I wait in line, before unsmiling customs and border control agents who don’t speak to us, I imagine being taken away by thin-lipped men in uniform for appearing too impatient for this strictly-run society. Standing in line the second day, I must have looked happy to be back, because the blonde-haired woman who solemnly stamped my passport the day before beckoned me with a smile when it was my turn to approach her glass-enclosed booth. En-route to our champagne river and canal cruise, our Russian tour guide, who studied abroad and spoke fluent English, tells us tourism didn’t really take off in St. Petersburg until the new port terminal for international passengers was completed in 2011. This new facility has berths for seven superliners. Our 19-deck Emerald Princess carries about 3,000 passengers plus a crew of 1,200. So I’m thinking a possible 14,000 to 20,000 people could stream down the gangways of cruise ships every day between May and September. As we make our way by bus to the city’s historic centre, the rows of identical concrete apartment buildings, built in the Communist era, give way to the newer glass office towers and restored 19th century apartment complexes. “The middle class is growing,” confirms our tour guide, citing three million cars for five million residents as evidence of healthy consumerism. “But only the Russian tycoons can afford to live here,” she gestures to the neoclassical façade of renovated 19th century condos stretching along the banks of the Neva River. Czar Peter I defeated the Swedes, who controlled the Baltic Sea, so he could have Russia’s first port. From uninhabited lowlands on the eastern Gulf of Finland, he created this series of 42 islands across the delta of the Neva River. Arched bridges over the river and miles of canals connect the islands that give the city its nickname Venice of the North. Influenced by his time spent in Amsterdam and London, this tall, energetic emperor was determined to bring Western Europe to Russia, our guide says. Not only did he hire European architects and city planners, he expected all men (except the peasants) to shave their beards and dress in Western clothes. Cruising down the wide and restless Neva River is simply the best way to take in the history and beauty of this imperial city, a UNESCO World Heritage Site. Hosted along the river and nearby canals, in baroque and neoclassical buildings, palaces, cathedrals and fortresses, are more than 100 museums. We pass the Peter and Paul Fortress, built by Peter I to defend Russia from Sweden, and later occupied by Hitler during WWII. All Russia’s Czars are buried behind the fortress at the Sts Peter and Paul Cathedral. We pass the opulent Summer Palace of Catherine II, where lavish parties were held during her reign, and see St. Isaac’s Cathedral, which dominates the skyline with one of the largest gold domes in the world. Peter’s home, and by that I mean the home of Russian monarchy for two centuries, was the Winter Palace, which he built in 1711. 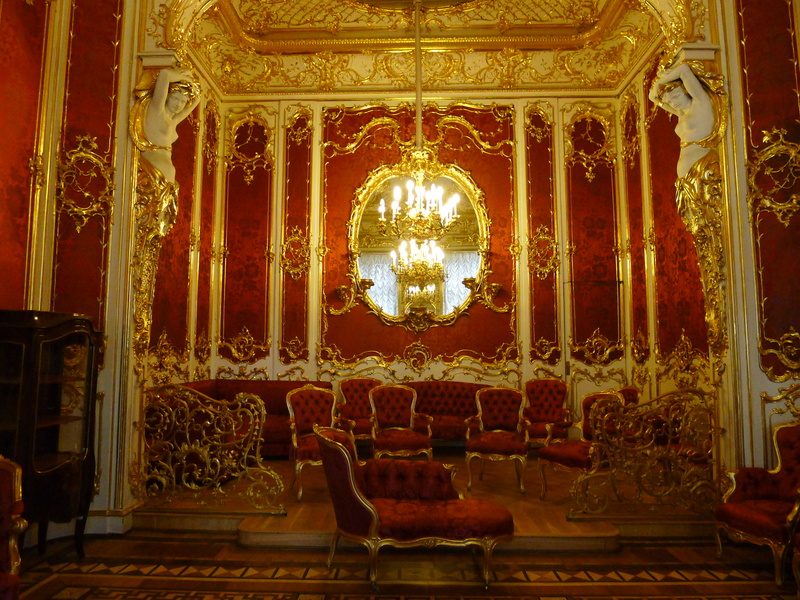 He slept in one of the 1,500 rooms (it slept 6,500) while waiting for his country retreat, the Peterhof, to be completed. Peterhof comprises a series of gardens and parks and palaces, designed in the Italian baroque colours of yellow and white lime. The lower parks feature 140 fountains and canals. Time did not permit a visit, but our guide says Peter the Great told his builders he wanted the palace to be grander than the royal chateau in Versailles, and it is sometimes referred to as the Russian Versaille. 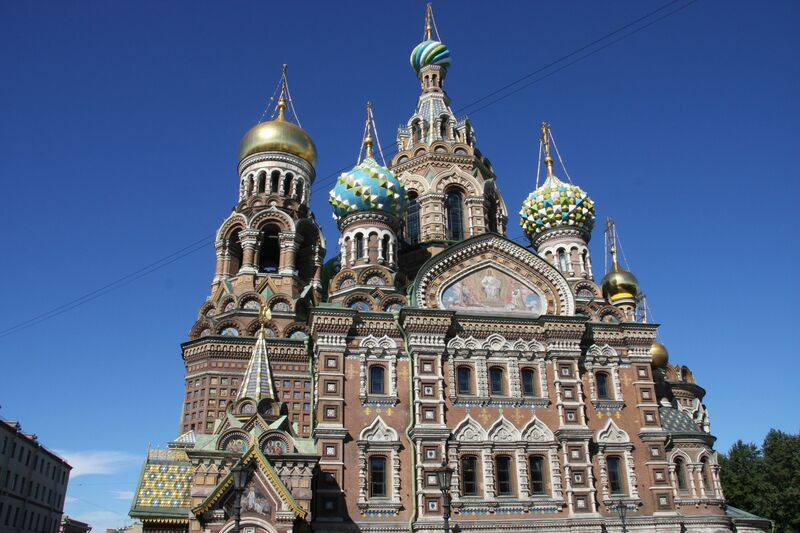 After the cruise, we visit the dazzling, multi-domed Church of the Savior on Spilled Blood, the medieval Russian-style church built where Czar Alexander II was assassinated in 1881. It took 25 years to build and was finished by Russia’s last Emperor, Czar Nicholas II. 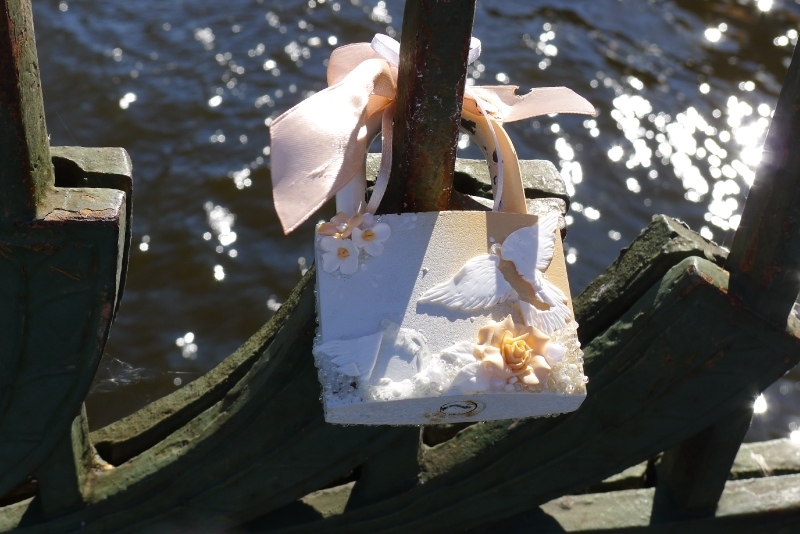 There is a canal near the church where newlyweds come for photos and to declare their undying love by placing a lock on the bridge railing and throwing the key into the canal. We looked for a lock to buy but couldn’t find any for sale. 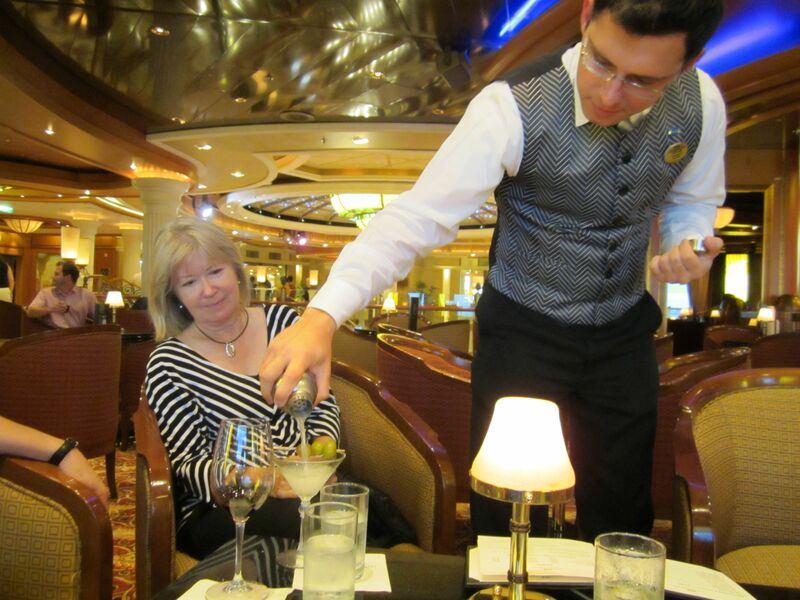 On our way back to the bus, we pop into the elegant Grand Europe Hotel, off the main Nevsky drag, for a vodka sampler. Tomorrow, we will visit one of the world’s most famous museums. Catherine II, better known as Catherine the Great, started to collect Western European art in 1764 and built a small hermitage building at Peterhof to display her private collection. 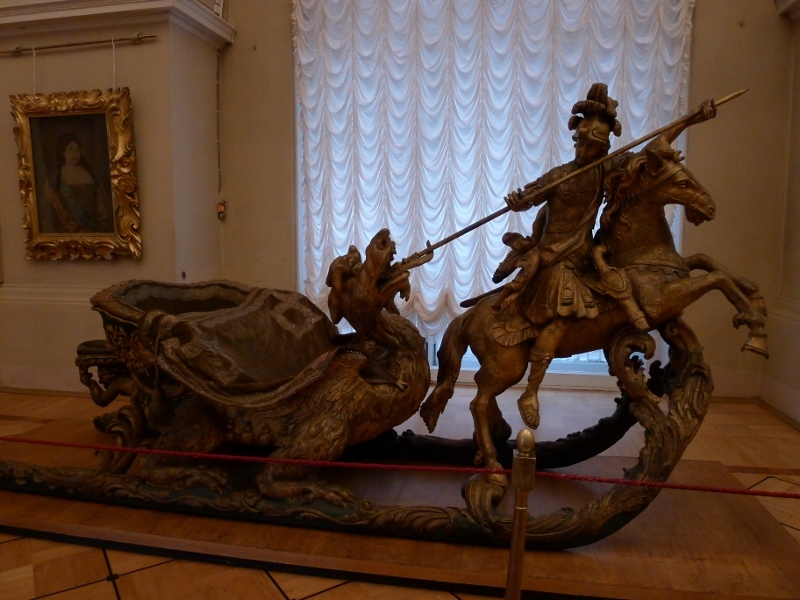 Over the 34 years she ruled Russia, her collection grew to fill three hermitage buildings at Peterhof. When the Winter Palace was declared a state museum after the October Revolution of 1917, it joined the other three hermitage buildings to form the State Hermitage museum of art and culture. The four buildings have been connected to make a square in the centre. We line up in the drizzle outside the riverside entrance to the Hermitage, standing along what seems like an endless façade of yellow and white lime buildings. Millions of visitors come each year to see the world’s largest collection (15,000) of paintings. Our guide tells us the Hermitage is the second largest art museum in the world, after the Louvre in Paris. Put another way, if you spent 24 hours a day here, and looked at each piece for 10 seconds, it would take three years to see it all. A 2012 travel magazine called the Hermitage the world’s largest, but size doesn’t matter when your tour group only has about four hours in the museum. 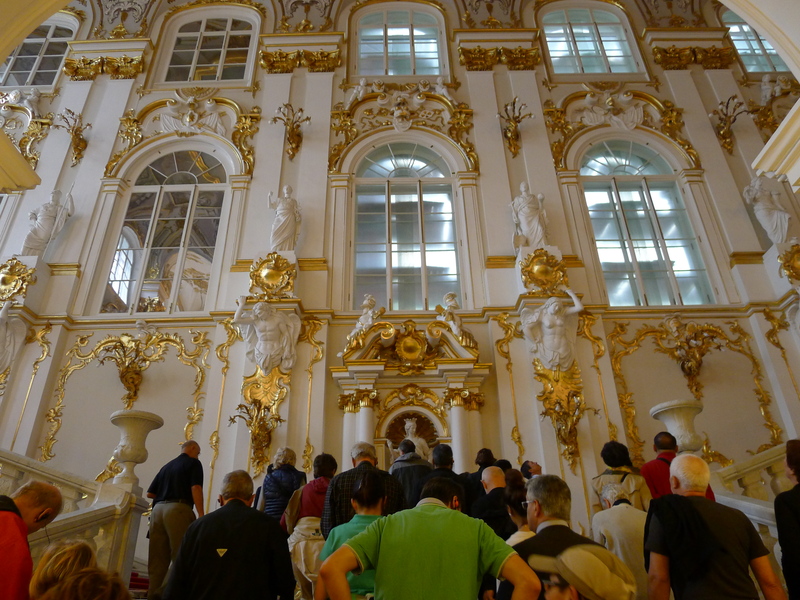 Fortunately, cruise ship excursions to the museum begin before the doors open to the public, so we have an uncrowded, but hurried walk through most of the state rooms and living apartments of Russian Czars. I quickly realize that the Hermitage is really two museums in one. Not only do these majestic four buildings house nearly three million separate pieces of art, they are also an architectural exhibition of the private living quarters of Russian rulers. The first floor (one up from ground) was my favourite with paintings from the 15th to 19th centuries from the French, German, English, Italian, Spanish, Dutch, and Flemish. I read somewhere the collection of works from the second half of the nineteenth and early twentieth centuries—Impressionism, Post-Impressionism, Fauvism, Cubism—is one of the finest in the world. 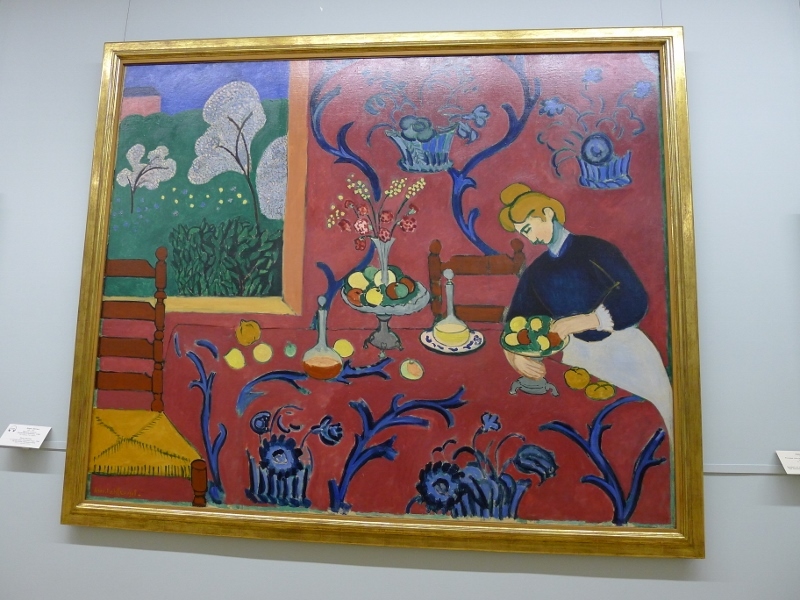 I’m a huge admirer of Impressionist and Post-impressionist paintings, so was thrilled to see so many recognizable pieces from Monet, Renoir, Degas, Cézanne, Van Gogh and Gauguin, Picasso and Matisse under one roof. Tourist Tip: You really need to keep those headsets on throughout the tour. Not just to hear about a particular piece of art, but to remain with your group when your guide disappears from sight when you’re shuffling shoulder to shoulder up one of 117 staircases or squeezing through one of 1,786 doorways. St. Petersburg was named after St. Peter and changed to Petrograd (Peter’s City) in 1914 and then to Leningrad in 1924. It was renamed St. Petersburg in 1991 to recognize Peter the Great, the founder of modern Russia. Our guide jokes about the city changing its name again. I don’t think Putinburg would have made my must-see list. And that would have been my loss. Started an email twice to make comments didn’t finish either of them. I think. Really enjoyed the writing. Personal references enhanced the story for me. Especially because of how I could relate to comments and situation. Good work. Makes me want to visit. Hi Dawna, I enjoyed that article. Sounds like a very interesting city.